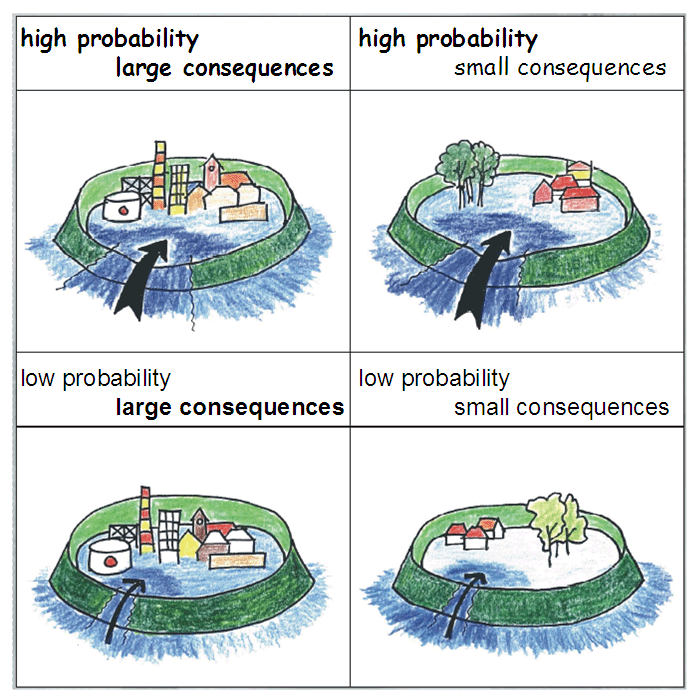 Probability and consequences determine the size of a risk. 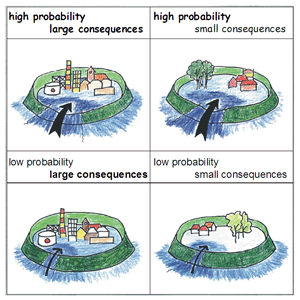 High or low probability, large or small consequences, how you determine that? The concepts high and low, large and small are relative. The people involved in the end determine what is an acceptable risk. A risk that we can live with. The government, provinces, municipalities and water authorities (or environment agencies) together with scientists, citizens and interest groups (such as natural and environmental organizations) decide how high a risk is acceptable. The discussion takes place in all kinds of meetings, through public opinion and in newspapers and television. If the risk is found to be too high, measures must be taken to reduce the risk. Scientists develop ways to calculate risks, on the basis of for example: water height statistics, climate figures, strength of dikes, estimates of the amount of victims and economic loss estimates. Measures cost money, often they cost space too that will be at the expense of other functions such as nature or economic activities. So choices have to be made. What steps should you take to make the risk of flooding of this new housing project acceptable? How much does it cost? Are those costs reasonable? Do these measures mean that other houses will become more vulnerable? Would it be better to build somewhere else? In the discussion about water safety scientists make use of various methods to investigate probability, pathways, receptors, vulnerability and costs of measures. Another tool is the use of scenarios. Yet it is not just a matter of addition and subtraction. How do you take for example the loss of life in your calculations? How exactly do you determine the chance of a breach? Do you calculate long-term injury or not? And how do you calculate the impact such measures have on the landscape? The calculations and analysis support the discussion, but do not decide on the conclusions in the discussions. People do.